New Honor Society is trying to change behaviors with the introduction of the “Sorry Jar,” a twist on the swear jar. The female-led creative shop wants women to place jars in their workplaces as a reminder to say what they really mean, without apologizing. They also suggest that funds collected be donated to charities promoting gender pay equality. The #notsorry campaign includes a website, where people can download labels and posters. FCB Inferno is challenging gender bias with a game that dethrones Kings and places the Queen at the top. The agency and Unibet will introduce The Queen Rules game with simultaneous live events and tournaments on March 8th in London, Stockholm, Malta, among other locales. Rather than play games the traditional way, competitors will instead use limited-edition cards that celebrate women, drawn by sixteen female illustrators from womenwhodraw.com. This project started when a five-year-old girl questioned why King ranks higher than Queen in a deck of cards. "This simple, yet powerful, idea is one way of sparking conversation around the unconscious gender bias that surrounds us – because sometimes the bias we don’t see, is as damaging as the bias we do," says an agency spokesperson. All proceeds from the live events and merchandise, including T-shirts, art prints and playing cards, will be donated to HeForShe, a campaign for the advancement of women initiated by UN Women. GroupM's Wavemaker is launching Women@Wavemaker, a new internal program to help women achieve senior leadership positions within the agency. After conducting a series of internal focus groups and surveys, the unit will concentrate on three themes - mentor, inspire and educate - lead by Camilla Bruggen from the Wavemaker global team and Emily Fairhead-Keen from the agency’s UK operation. The initiative, comprising both men and women, will now find ways to support and solve these challenges. The program kicked off on a Women's Day panel discussion held at the agency's London office. The sessions have become a quarterly event. IPG's Momentum is recognizing International Women's Day by creating a program designed to improve work-life balance. The agency's new flex work initiative will enable employees to develop bespoke work schedules structured between them and their managers. In addition, the program will introduce a freestanding robot that will enable them to be “live” when they need to attend important meetings but cannot physically be in the office. Also the new MFit health and wellness program will introduce Momentum-sponsored classes, team events, activities and speakers as well as options to book personal or small group training sessions. "Our industry is losing too many talented people to unreasonable demands that put unnecessary strain on families," says Donnalyn Smith, North American president, Momentum. "We’re tapping the most advanced technologies to help meet client demands" and "we’re also using technology to provide our staff with the kind of support they need to thrive at Momentum." 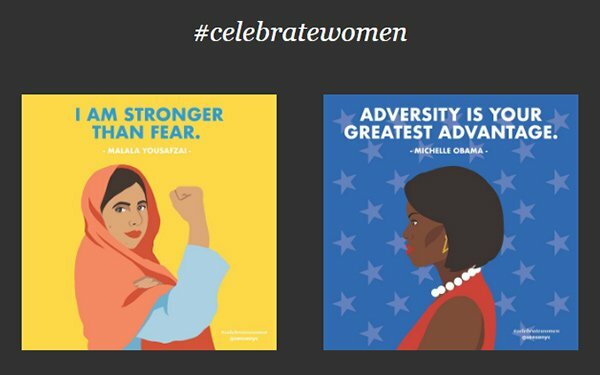 Sense New York has been releasing illustrations of "fearless" females, including Malala Yousafzai and Billie Jean King, each day between March 1 and 8. Designed by the agency's NYC creative director Nathaly Charria, and illustrator, Alana McDowell in London, the artwork is shared across the agency's social networks and is available to download from the Sense website at www.sense-nyc.com/celebratewomen. "We hope other women will be inspired by the work and words of wisdom from our ‘sheroes’ and will further spread the love, by sending the images to friends, family, clients and colleagues, who inspire them, and deserve to be celebrated, too," says Sarah Priestman, president, Sense New York. As part of the "Word to Your Mother" project, agency Peterson Milla Hooks is sending handwritten notes to women who have helped members of the Minneapolis-based, female-majority led agency "better be themselves and be better for others," says an agency spokesperson. To highlight the women at Fake Love, the Brooklyn-based experiential agency is creating a collaborative video and a celebratory newsletter. After sending out a form to the women in the company with questions related to International Women’s Day, (history, relevance, thoughts on feminism, etc.) the agency used the answers to script a video that celebrates women. Smashing Ideas is featuring women at the Seattle-based digital agency with short videos and giving them an opportunity to voice their truth in light of this worldwide holiday. The agency will debut the series across social media on Thursday, but plans to "keep the conversation going in the weeks to come," says an agency spokesperson. VML is producing mad-libs style cards to send across the agency's 33 global offices with the goal that every female at the agency receives at least one card. VMLers are invited to write positive notes to the women at VML that they work with and admire, with each office hosting a specially-designed common area to fill out these cards. There will be collection stations and volunteers to distribute them. In addition, the microsite at https://iwd.vmlconnect.com lets workers send cards electronically.